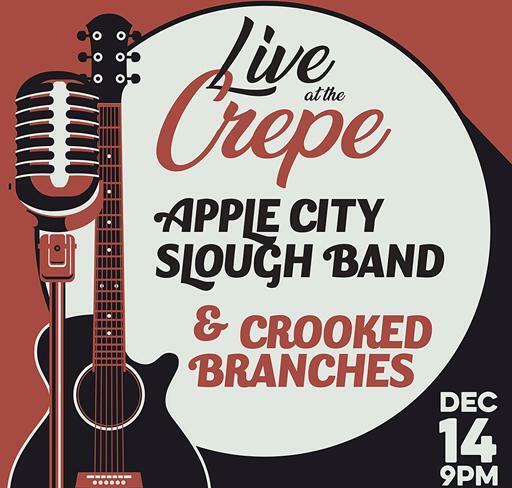 The Apple City Slough Band is a Santa Cruz Mountain Jam Band that will tap into your rock & roll roots. Spirited songwriting layered with gutty rolling leads and keys… the Apple City Slough Band delivers a loud and proud Americana rock sound. Hailing from the original Apple City (Watsonville, Ca) we’re a close-knit band that plays for the love of a good time. Based out of California's Santa Cruz Mountains, Crooked Branches features a soulful, acoustic sound that weaves lyrical storytelling with down-home grooves. Their debut album showcases songs that tell stories about home, family, and good old fashion self-loathing. Musical guests on the album include Don Mackessy (banjo) of the Naked Bootleggers, and Andy Zenzcak of Gadgetbox studios.